Halloween is officially over. Which means lots and LOTS of leftover candy. Am I right? When I was a little trick or treating Kayle (whether I was a brunette Barbie, the Queen of Hearts, I Dream of Jeannie, or whatever I was) I obviously played favorites with my candy. Any purely sugary candy (such as dots, smarties, etc.) were given to my mom and/or brother, Crunch bars also went to my brother (his fave). But if there was chocolate and peanut butter: THEY WERE MINE. In particular....I would hoard my Reese's and Butterfingers as if I were Gollum and they were my preciouses. I would legitimately have my Halloween bucket hidden under my bed with a large supply of these favorite candies, hopefully enough to last me until Christmas. Even as a young child...I was a planner. No OD'ing on candy in one night for me, oh no, I thought further ahead. I thought to myself, "What about future Kayle...Kayle 1 month from now....she might want herself some candies." I was a considerate little lady. But...now I'm like a grown up. And life is different. And I can no longer just hide candy under my bed. You may feel the same. And sometimes....we need to use up some of the candy (*gasp* I know! Children, cover your eyes!) 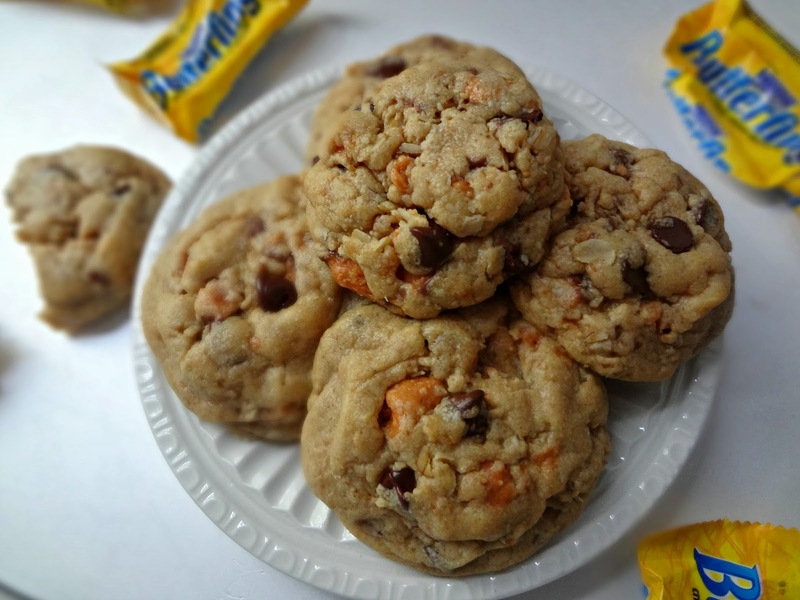 But seriously....there is not better way to use up some of those delicious, peanut buttery, crunchy, Butterfingers than in these cookies. 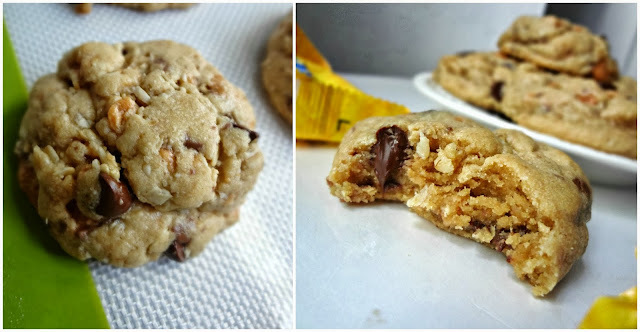 I got TONS of rave reviews for these babies, Michael even said they may be a new favorite. And who can blame him? 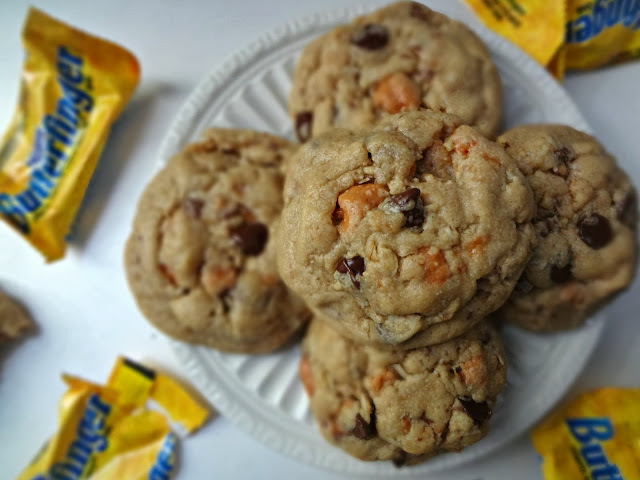 We've got these puffy, chewy, peanut butter cookies with an awesome bit of texture from the quick oats, loaded with chunks of BUTTERFINGERS! Oh and they stay ridiculously soft for like...ever. Or at least for a long time. They seriously just keep getting better with age sooo....like...attempt to not eat them all right away. 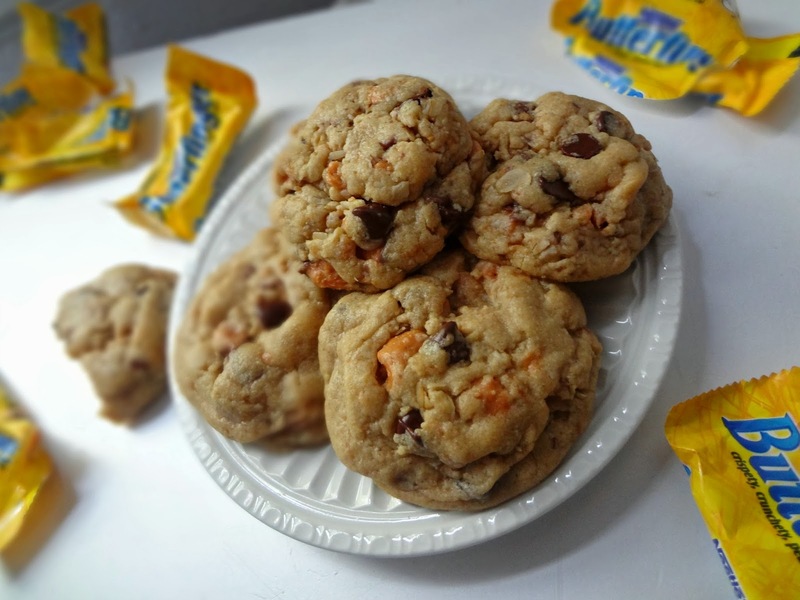 Nobody better lay a finger of my Butterfinger...cookies. If you need me, I'll be hiding any leftover cookies under my bed. In a large bowl (using a hand mixer or stand mixer with paddle attachment) cream together the butter and sugars on medium speed until fluffy, about 3 minutes. Beat in peanut butter, then egg, then vanilla. In a separate bowl whisk together the flour, salt, and baking soda. Slowly mix the dry into the wet ingredients. Fold in the quick oats, chopped Butterfingers, and chocolate chips. Chill for 30 minutes. Preheat oven to 350 degrees and line a baking sheet with a silicone baking mat or parchment paper. Roll balls of dough (about 2 tbsp.) and place on the prepared baking sheet, leaving an inch or two of space in between. Gently press the top of the dough down, just a smidge. 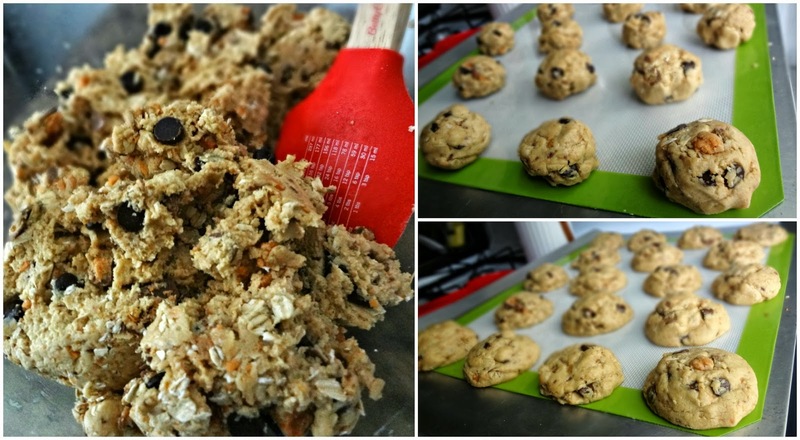 Bake 8-10 minutes (not longer! )-they will look underdone but will firm up as they cool. Cool on sheet for 10 minutes and then transfer to a wire rack to cool completely. 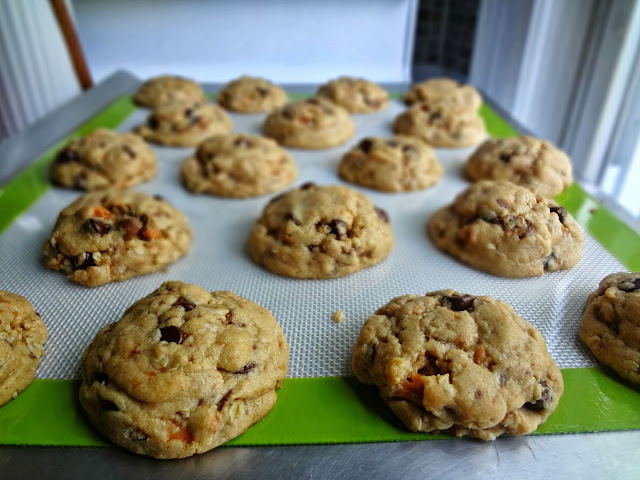 Store in an airtight container for up to a week, cookies also freeze well.